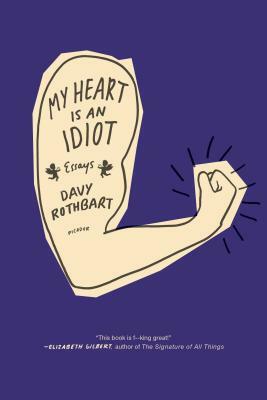 In My Heart Is an Idiot, Davy Rothbart is looking for love in all the wrong places. Constantly. He falls helplessly in love with pretty much every girl he meets—and rarely is the feeling reciprocated. Time after time, he hops in a car and tears halfway across America with his heart on his sleeve. He's continually coming up with outrageous schemes and adventures, which he always manages to pull off. Well, almost always. But even when things don't work out, Rothbart finds meaning and humor in every moment. Whether it's confronting a scammer who takes money from aspiring writers, sifting through a murder case that's left a potentially innocent friend in prison, or waking up naked on a park bench in New York City, nothing and no one is off limits. And it's all recounted in Davy's singular, spirited literary voice, "an intriguing hybrid of timeless midwestern warmth and newfangled jive talk," in the words of Sarah Vowell. Davy Rothbart is a frequent contributor to This American Life and a variety of magazines, the founder of Found Magazine and the editor of its various bestselling anthologies, and the author of The Lone Surfer of Montana, Kansas. He was born and raised in Ann Arbor, Michigan, where he still lives.